Well let me make this easy for you…. Instead of rushing around after school between hairdressers and make up appointments…. Lost ties and shoes. I can deliver the buttonholes and corsages straight to your school… so they are ready when the bell goes and the excitement starts. If you would like free delivery to your schools get a group of friends together and I can deliver them free of charge to 10 or more corsages to the same school. So if you would like to order a corsage or buttonhole, simply click below to order. Corsages are $25 with flowers and ribbon or $30 with flowers, ribbon, diamantes or pearls. Buttonholes are $8 each. The corsages don’t have to be the same contact me via email or give me a call and I will design a corsage and matching buttonhole to compliment you outfit. 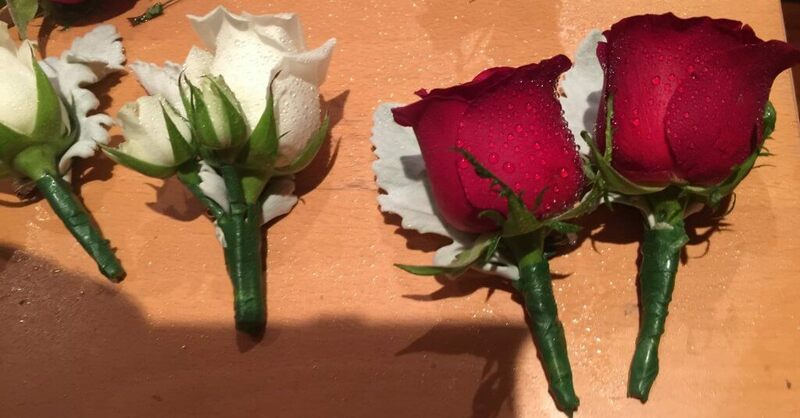 This entry was posted in Bayside Weddings and Events and tagged #baysidebouquets, #buttonholes, #corsages, #easyweddings, #melbourneweddings, #roses, #schoolformals.